How to study efficiently in five steps with visual thinking ! How to study faster and better ? How to memorize things ? How to understand better ? How to get ready for the next exam ? Here is my method in five steps to study better with visual thinking and memory techniques. Lisez ceci en français ! If you examine the main difficulties of the students, in secondary school as well as at the university, it seems that “learning to learn” is the key expression. Some teachers event refuse to admit that there is such thing as “learning to learn“. And yet, I’ve helped a lot of student by teaching them this method : everybody has the potential to learn better. If you get the appropriate method and the right tools. This is also the method I’m going to talk about at the Biggerplate Unplugged in Utrecht on the 9th of October. Don’t miss that fantastic event ! I’ll consider each stage in detail in articles to come. But let’s review the whole method here ! First step : Reboost your motivation ! In order to learn, you need to be motivated. So, think about your studies as a project. Each of your courses can be considered as a project with Smaart goals, deadlines, tasks to achieve. 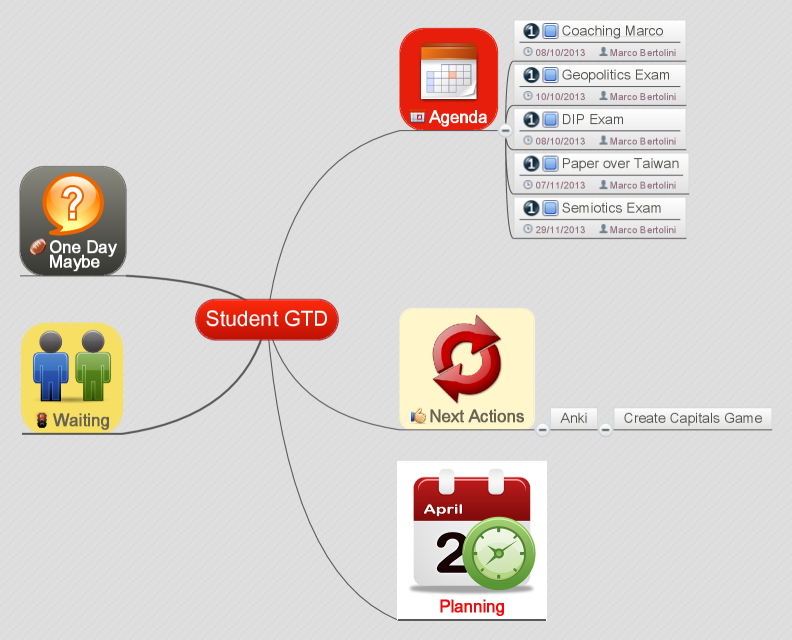 I personally use an adapted version of GTD with Mindmeister. Define your goals and your motivations : why do I study ? Whom do I study for ? Myself ? My parents ? My professors ? My girlfriend ? What do I want to achieve ? What kind of profession do I want to do later ? What are the stages, the necessary training, the adequate degrees to reach that long term goal ? What do I like ? What do I really want to learn ? If you know yourself and what you want to achieve, if you have the right tool to handle the workload of studies, you can succeed. And guess what ? Succeeding is the best way to succeed ! What I mean is : succeed in small things first, that will strenghten your selfconfidence, and you’ll be able to succeed in bigger stuff. And finally, you’ll succeed in your studies as well! The day itself, when you go back home, open your books and reread your notes : read slowly, let the ideas get back to you. 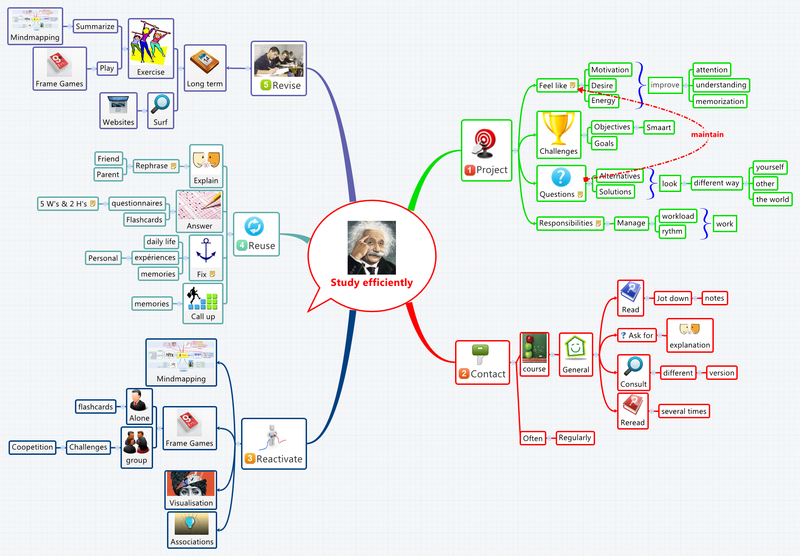 Jot down some notes with a mind map : I don’t know any more powerful or efficient tool to summarize something than mind mapping ! The association of keywords, colours, images, branches, place on the sheet, everything concurs to memorize and understand better than with boring linear notes. Try to remember what the teacher or the professor said. Try to identify what you don’t really understand and ask for some explanation. This is the right time to do so : you have fresh ideas, it will be easier to connect the new concepts to what you already know. Futhermore, if you wait for the day before the exams, everybody will be busy and who will waste that precious time to share something with you ? The secret of memorizing is : first, understand what you learn. Create links and associations with what you already know. 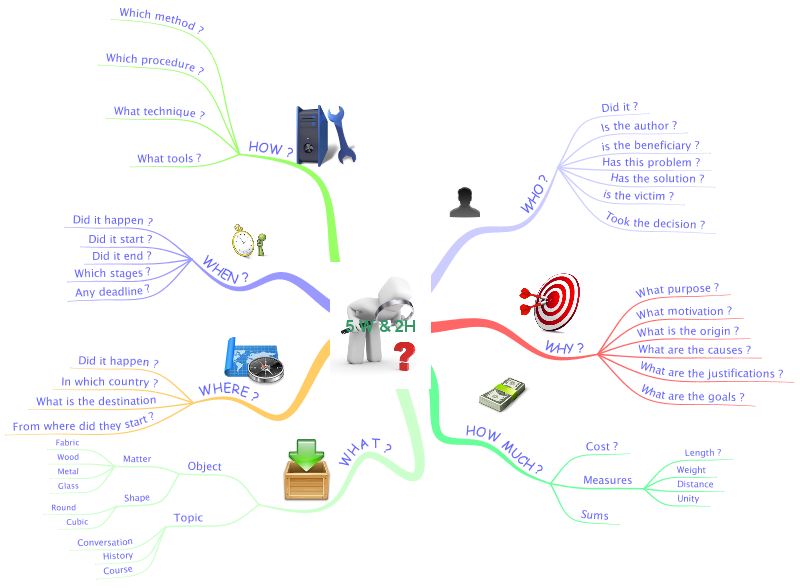 Make another mindmap or complete the one you started at the previous step. Then, try to ask your own questions, with the 5 W’s & 2 H’s method. This is a very old and efficient way to learn. When you summarized the course with your mindmap, you entered the matter through the professor’s path. It was His or Her structure. By asking questions over the course, you’ll build your own path, your own way to question and to understand everything. 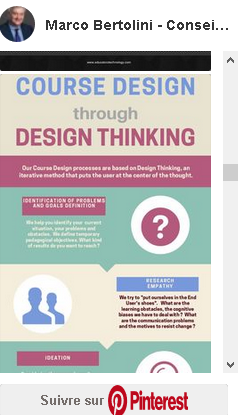 Use concept maps to grasps the different concepts. Use flashcards to memorize definitions, names, formulas. Use devices like XMind2Anki to turn your mindmap into a deck of flashcards. The best way to learn on the long run is to vary the tools and the techniques : use bubble and doublebubble maps to compare two objects or groups of concepts. Teach ! Tell your stuff to a person who doesn’t know anything about it. This is the best way to learn : why do you think professors know their courses so well ? Because they keep on teaching it ! So, train, review, exercise, vary the methods and the techniques. This is the secret : use your whole brain ! Did you like this article? Sign up for my newsletter and never miss any item or event! XMind 2012 : still more efficient ! XMind 3.2.1. had already improved a lot compared to previous versions. XMind 2012, the latest version, comes with more good surprises ! A more business oriented Mindmapping program ever. XMind is cheap, powerful and user friendly : that’s why we love it so much ! Today, it comes with the new 2012 version : not a great revolution, but some powerful and very interesting features. And above all : business oriented features ! But features equally interesting for students, projects leaders, and so on. So the days of the sad blank page with the bluish central topic are over ! Now, when you open a new page, you automatically get a set of themes and templates. Which saves you a lot of time ! Themes and templates open automatically with the new page in the new XMind 2012 version. A good way to save time ! So now, you can define the background colour, the type and thickness of your branches, the shape of your topics before you start drawing your mindmap ! You can also choose to start with a mindmap, an Org Chart, a SWOT analysis, a Time Line, etc. The button on the left inferior corner of this window allows you to add your own themes and template : this will save you a lot of time on page layout ! You can also open a existing document from this dialog window : this is much more ergonomic than before : all commands are gathered in a single, manageable area. This is an amazing feature for business owners and project managers : before, the Gantt diagram was a little bit too basic. The new version is much more complete : it is now a real project management tool ! Here, I made a simulation of an email campaign project with task distribution for a team of 4 colleagues. I combined the mindmap view with the Gantt view so you can see the relationship between both. 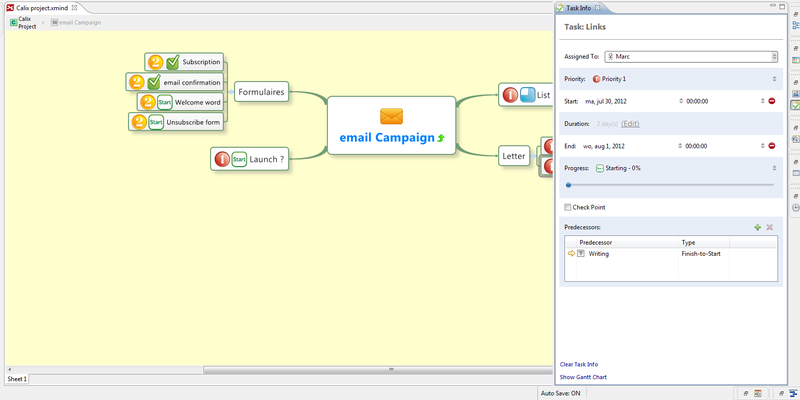 I drilled down the mindmap so we can focus on the topic “email campaign” and its subtopics. (Click on the map to enlarge it). For instance, Juliet – the long red line on top of the diagram – has to encode the names of the subscribers in a list. She started on the 12th July. Her deadline was the 31st of August. She achieved 76 % of her task. Marc – second line on the diagram – had to write the text of the letter before the 27th of July and didn’t finished before the deadline either. Both tasks are displayed with a danger triangle board. Another very interesting new function is the possibility to link two tasks : the second one cannot start as long as the previous one is not completed. 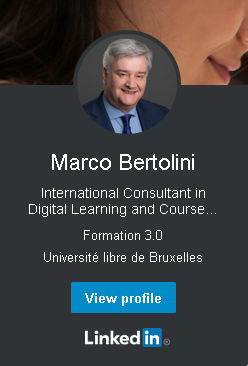 For example, in the picture below, Marc had to put links in the newsletter after having written his text. But the text has not been finished and the tasks ‘links” cannot begin ! If I click on the yellow icon, a text in a bubble warns me that this task must be postphoned, since the previous one has not been achieved. (Click on the picture to enlarge it). The panel on the right tells me that there is a “Finish-to-start” relationship between the predecessor ‘Writing” and the present task “Links”. “Writing” must be finished so that “Links” can start. Now, the tasks function allows you to program not only the date of a deadline, but also the number of days and even hours that you estimate which are necessary to achieve this task. That makes this new version of XMind, a real project management tool ! And the XMind teams promises to go further and to improve the Gantt chart in the future. XMind is thus more and more business and project management oriented ! It is a new position on the market of business mindmapping programs. If you want to download XMind 2012, it is free !